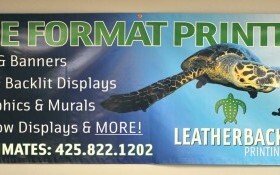 Leatherback’s first foray into Wide Format printing came via Latex Roll-to-Roll printing. After our expansion in 2013 featured a second facility dedicated to Wide Format, we upgraded our roll-to-roll capabilities with a new HP Latex 3000 in December of that year. The LX 3000 features environmentally-friendly water-based inks that achieve the same durability and versatility as solvent inks across all sign and display applications. Additionally, the machine has an embedded spectro-photometer that enables automatic calibration, creating excellent color consistency and allowing print resolution up to 1200 dpi. The LX 3000 also produces odorless prints, ideal for indoor displays. The LX 3000 is yet another example of Leatherback’s commitment to pairing high quality with environmental awareness. What are the main advantages of latex roll-to-roll printing?